We were curious to uncover the site’s biggest problems, so we used UserTesting.com to find out. Random, anonymous people were asked to complete various tasks on Healthcare.gov. UserTesting.com records their screen as the users navigate the site, explaining what they’re thinking and feeling. This is a wonderful – and affordable – way to see how users interact with a site, and should have been done at several stages of development before the site was launched. Inability to create an account! After filling out several pages of personal information, one user received a message (see below) that the system was unavailable. Her only options were to try again (which forced her to repeat every step in the process) or initiate live chat. A site of this magnitude is under tremendous burden simply because of the number of people on it at any given time. And they aren’t just browsing around reading articles; they’re using up processing power by setting up accounts, filling out wizards to get quotes, and submitting applications. Reduce the chance for user error by improving usability. More suggestions on that below. Techies can check out more technical suggestions here. I realize the developers really want people to create unique user names and secure passwords, but they forgot they’re dealing with the general public. This includes people who are not web-savvy, not educated, in a hurry, speak English as a second language, and/or don’t read the fine print. As Alan Cooper writes in The Inmates Are Running the Asylum, developers should not be allowed to dictate user experience. God love ’em, developers have brilliant minds, but John Q. Public does not possess the same attention to detail. By putting four lines of instructions under the password, developers think they’ve covered their bases and explained how to create an acceptable password. But those four lines of text require users to think more than they should have to think. Plus, all those user errors require more processing power, which puts a strain on the system. People should be allowed to use an email address as a user name. They are used to that, and they can remember it. That is currently not possible, because the period is not an accepted character (although the instructions say it is). But I got an error message with a period in my user name, and it was accepted once I took the period out. The requirements for the user name and password should be the same. 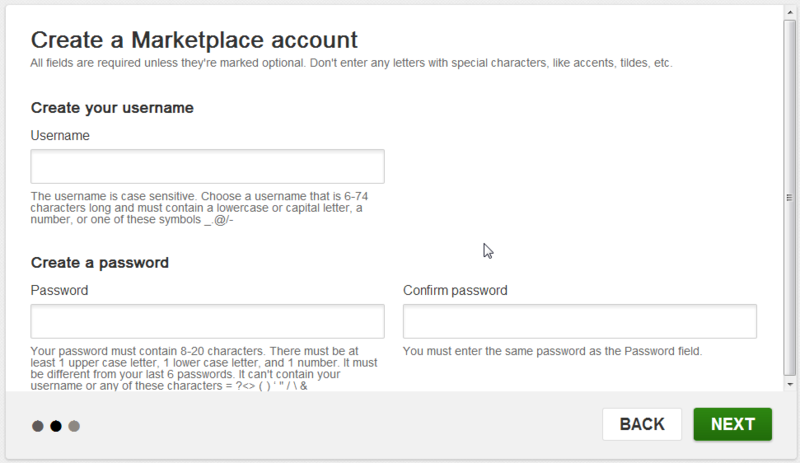 Why does the user name need to be 6 – 74 characters long, whereas the password has to be 8 – 20? User names can have upper OR lower case letters, while passwords MUST have one of each. And the random characters acceptable for each is different. Don’t make users work this hard! It would be more beneficial to tell the user what the specific mistake was. In fact, tell me if YOU can figure out why I got the error message here, because I can’t figure it out. One user was able to create his account, but then was unable to actually apply for coverage because the “continue” button simply didn’t work. He had to abandon his task and find another way to get to the application — which makes me wonder why people even need to create an account. There was nothing explaining the benefit of having an account, and it wasn’t necessary in order to apply, so why is it there? Your first step is to set up a Marketplace account. We’ll ask you for some basic information, then you’ll move along to the Marketplace application. But when the user above was unable to create his account, he bypassed that step and found another way to get to the Marketplace application. Second, obviously, is that the “Continue” button should work. Our user may have run into a problem because of excessive system strain at the time he was creating an account, so addressing the issues described above to save processing power would likely fix this. Several users didn’t know where to start. Some were given the scenario to imagine they already had coverage and were interested in obtaining insurance through the Affordable Care Act instead. Others were asked to imagine that they were later in the buying cycle, ready to apply for individual coverage. The users all seemed to start the process differently, and several expressed confusion over where to start, as they hovered over the multi-level navigation and multiple calls to action. They all wanted to find the path that pertained to their specific situation and unique needs, and were unsure which options would take them there. The multi-level menu system was an attempt to let people self-select the best path for their needs, but it required more brainpower than it should have. Anytime a user has to stop, deliberate, and wonder where to go, the site has failed that user. For more on the philosophy of making your website effortless and intuitive, read Don’t Make Me Think: A Common Sense Approach to Web Usability by Steve Krug. The tabs across the top to “Learn” or “Get insurance” are good for separating users who are still in the research phase from those who are ready to sign up. But the tabs aren’t obvious. I don’t think I even noticed them until watching the 4th user test. Furthermore, notice that the user in the screenshot above was on the “Learn” tab. 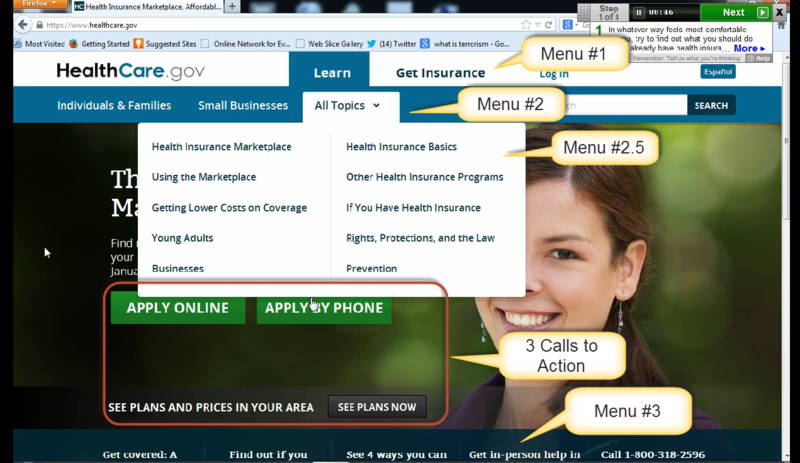 Yet the primary calls to action are to apply online or by phone, which should be on the “Get Insurance” tab. Someone who is just starting his research is not ready to apply yet. Incidentally, those calls to action are smaller and below the fold on the “Get Insurance” tab, where I’d expect them to be prominent. The calls to actions on those two tabs are bass-ackwards. A wizard would be helpful here, too, so people could answer questions that would direct them to the appropriate information for their specific situation. In order to build that wizard, a User Experience (UX) expert would need to be brought in to define the tasks that different types of users are trying to accomplish on the site and how each type needs to flow through the site to get the information s/he needs. I can’t imagine that a site of this importance did not have a UX person working on it, but there seems to be room (or an entire hotel!) for improvement on user tasks. 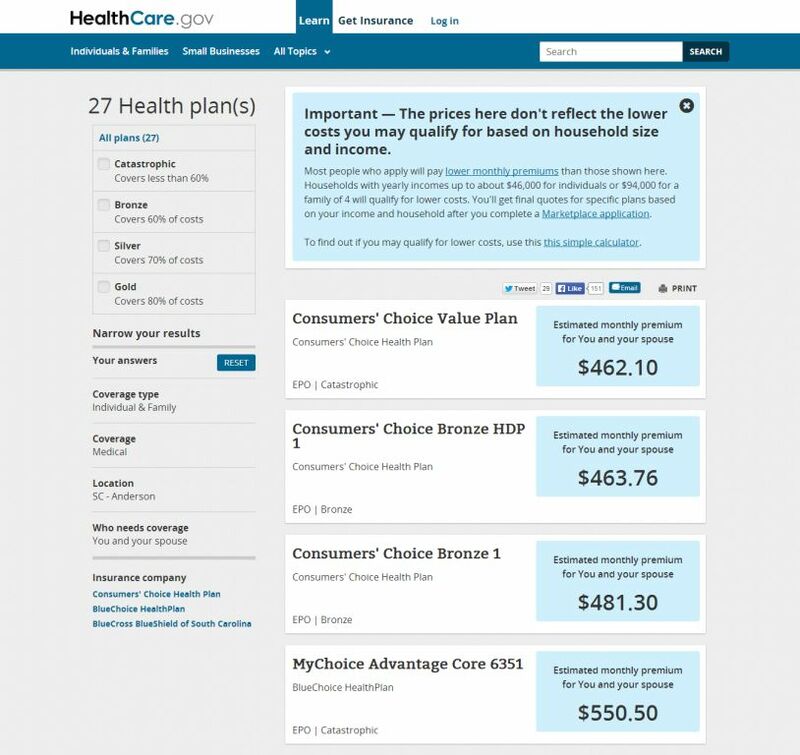 Regardless of whether a user’s scenario included already having coverage, they wanted to be able to compare their options easily, which they weren’t able to do. Those who were told to imagine they already had coverage wanted to know how the premiums and coverage in the exchange would compare to their existing plans. Those who were given the broader scenario still wanted an easy way to compare the various plans available. The message on the top states that these prices don’t reflect the lower cost they might be eligible for based on household size and income. In order to get to this page, users had to answer several questions. Why not add those two questions and give them results that are actually useful? There’s nothing to base a comparison of options on, other than price and whether the option falls under the Gold, Silver, Bronze, or Catastropic plan. Even if the prices were accurate based on income and household size, users didn’t have much information to base a decision on. At a minimum, adding questions abut household size and income would result in more accurate estimates. But it wouldn’t solve the second and third issues. Users should also be allowed to click on each option to get more details. They should also be able to add them to a list where they can compare the details of each plan they selected in a grid. Again, knowing the information that people need in order to make a decision, and the tasks they need to perform to get that information, is a critical step in the UX process that would have anticipated this, but which seems to have been missed. They also have a blog where they’re documenting their updates. According to their post dated Oct. 31, they brought in people from Google, Oracle and Red Hat to help fix the site. But what gets a conversion optimization geek like me excited is seeing that they’re running scripts for Pingdom, Google Analytics, Crazy Egg, and Optimizely. If President Obama’s pet project was a big flop, don’t feel so bad about your site’s mistakes. Be thankful it’s not as public as Healthcare.gov, but act like it is. If you’re launching a new site, follow a strict UX (User experience) process, which includes running user tests at several stages of development. For existing sites, never be satisfied with current performance. Actively seek out problems and test for improvements with my 7-step process for improving conversion rates. Reduce the chance that you’ll have to apologize to your customers for your website and pay a lot of smart people overtime to fix it! Find out more about how to optimize your website or landing pages for better Conversion Rates. Call 888-659-2680 for your free initial consultation with the Conversion Max team.